Whenever we think of the wholesale and the distribution we may have a dull image of the olden day markets. But as technology has advanced so has the industry gone a step ahead with it. A lot of factors like globalization, consolidation, competitions are the one that affecting both the large as well as small scale distributors which in turn has made them transform their supply chain and business models. For this purpose they need to shift the cost, reallocate the resources and try to find new sources of competitive advantage. Out of all the industries the wholesale and distribution industries are the one who experience a transformation. Squeezing up the margins, shifting the channels, e-commerce, increasing the various product offerings and have some high expectations of the customers in terms of some new services are some of the major issues faced by this industry. Staying ahead in the competition is something which all the companies want and for doing this the wholesale and distribution companies need to implement the technologies that will integrate their business systems which will help them to provide a visibility across the entire company, customers and even the suppliers. The ERP systems for this industry need to be designed in such a manner that will enable the companies to focus on the customers and be ready for operations. One of the best advancements that IT has is the Cloud technology. It helps the small to the mid-sized firms for all the computing needs. This helps them to limit themselves with the larger competitors. The cloud ERP helps them to access data anytime and anywhere. They are specially meant for the workers of the wholesale and distribution industry who may need an access at any moment of time. Keep in mind a customer portal. Think about what all services would you offer to your customers like self-service to their account status and history of their orders, announcements and the information regarding the products. If the customers have an access 24/7 it can lead to some great accuracy and efficiency which in turn will increase the customer satisfaction. All the systems like the inventory and contract, order process and fulfillment and rest of the systems which are required by the wholesale and distributed industry can be automated. The Cloud ERP has specific benefits for the organizations in the wholesale and distribution industry. They can reap benefits such as flexibility, easy collaboration, high security, increase in performance, high integrations and increase profitability. 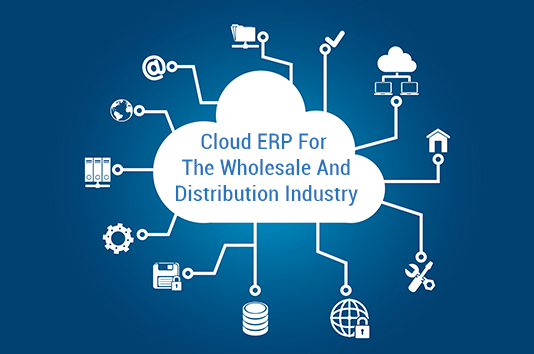 Consider Inspirria Cloudtech as your premium partner for implementing the ERP systems for the Wholesale and distribution industry which will serve the customers for all the services. Take us as your new cloud innovation partner with decade plus of experience working with 450+ Cloud projects. Push productivity to its optimum level with proven solutions, which is used by the best companies all over the world.